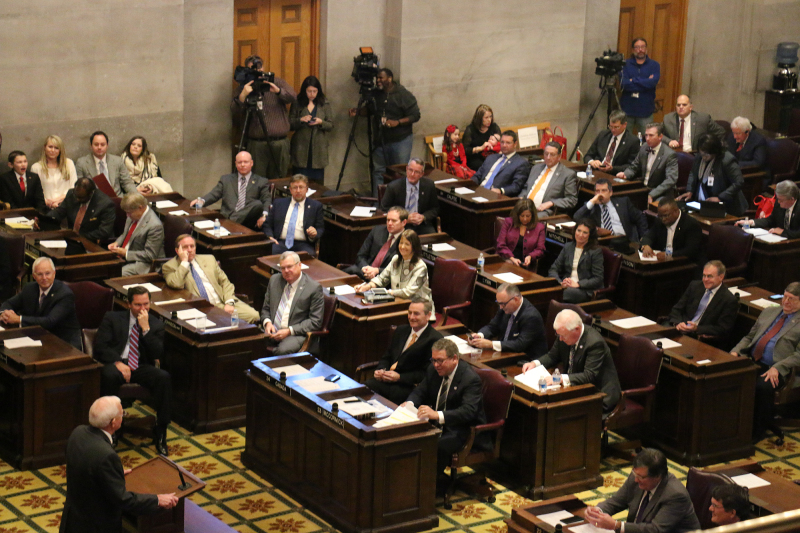 School vouchers and charter schools continue to be a hot topic in Tennessee. Until the August primary, the Home Page will ask the candidates running for the legislature questions every week ranging across the board of issues facing Williamson County. Some advocates of school privatization call public schools “government schools” with the implication that public schools are hopelessly snared in red tape and inefficiency, and that the private sector could do better. Do you see more advantages in one system over the other? Or do you favor a hybrid of public and private control of public education such as exists in many school systems today? All four of our children are educated through the public school system, so naturally I believe in our teachers, administrators and all those who contribute to our wonderful Williamson County school system. I also believe that private schools create needed competition and accountability for our public schools system. So I support the existence of both the public and private school systems. That’s certainly not the case in Williamson County, where we see not only outstanding results but hundreds of parents involved in the school system. Our public schools are not broken here – quite the opposite. In failing districts, like what we’ve seen in Memphis for decades, I have supported a pilot program to test the voucher concept with the bottom 5 percent. Let’s see what kind of results can be generated with that pilot, and if the private sector can move the needle where others have not been able to. This is a general answer to your question as I feel Williamson County public schools are, by-and-large, a cut above other public schools throughout the state and country. Public schools do indeed seem hopelessly snared in red tape and inefficiency – they also seem to be indoctrination mills, with an educational platform focused on liberalism, socialism, mediocre performance, and thought patterns that often defy common sense. Public school teachers must educate within the confines of government and bureaucratic dictates that forbid discretion, distort American history (if it is taught at all), and, by law, ignore a child’s spiritual development. The benefits of private schools are obvious to any discerning parent. Many studies attest to this and education-oriented parents, who want to provide their children with the best possible foundation for the future, continually turn to the private sector for their child’s education needs. One overriding component that separates private from public schools is the ability of private schools to teach sound moral values, typically through some form of religious education. These values are essential to a child’s spiritual development and proper upbringing. Private schools are safer than public schools as they foster a more secure, orderly environment for learning. Discipline is not only expected, but required. Problems such as disrespect for teachers, tardiness, absenteeism, being unprepared to learn, the lack of parental involvement, and student apathy are significantly increased in public schools when compared to private schools. Finally, private schools have higher expectations for academic success. Students in private schools consistently score higher in standardized testing than do their public school counterparts. Private schools have more stringent graduation requirements and their students are typically enrolled in more challenging coursework – especially in the fields of math, science, and computer technology – relevant studies that provide a foundation for the advanced education programs that they often pursue in the future. Interestingly, students from lower socioeconomic levels seem to benefit the most from private schools [also see my position statement referring to school choice on our website, tasmith4tn.com]. The higher college graduation rates among private school attendees clearly shows that they are better prepared for college as they leave high school with a solid educational foundation and higher prospects for the future. When addressing education issues, the first questions should always be: what is working and what is best for our children? Currently, Williamson County Schools are excelling due to our strong families and teachers who expect and attain results from our children. Sadly, this does not exist in some school districts here in Tennessee. This is why I support the proposals from Gov. Haslam relating to options for families who are zoned in failing school districts. Children who currently attend a failing school should have the same options that Williamson County children have: the ability to attend a successful school. The governor and conservatives in the legislature support allowing parents to either use vouchers for their child to attend a school of their choice or to attend a charter school. Both of these options allow students the ability to escape a failing school that they are forced to attend because of where they live. The Republican General Assembly, working in conjunction with Gov. Haslam, has attained great success in education over the last several years. These reforms have helped spur Tennessee in becoming the number-one state in the country for overall improvement in student test scores. This year, we invested the largest amount of money in our K-12 education system in state history without a tax increase. As we move forward and continue our education reforms, I believe charter schools and vouchers have a place in our state and can benefit those students who are being left behind. These reforms will not affect Williamson County Schools as we already have some of the best school systems in the state. As a state legislator, I want to give opportunity to all the children of Tennessee to be able to experience the kind of success we have in our community. I attended the Williamson, Inc. State of the County address with Mayor Rogers Anderson last week and was reminded once again how important our public schools are to Williamson County. I’m a proud public school parent and a vocal public school advocate. People move here for our public schools, our property values are up because of our public schools and corporations build headquarters here because of our public schools. I cannot be more clear when I say we must protect our public education system and stop electing representatives who take money from outside special interest groups who support privatization. Our children and teachers deserve to be represented by someone who will fight to fully fund our public schools and I am that person. I’m a product of both Franklin Special Schools and Williamson County Schools, and grew up attending FSSD school board meetings while my mother was a board member. It’s hard to be any more pro-public school than I am. The very name ‘charter’ is misleading. In fact, charter schools take taxpayer dollars away from public school systems to pay for what are essentially private schools. Meanwhile, the public school systems have the same expenses to pay, minus the revenue. I’m not a fan but while some large urban systems can make an argument for charters, Williamson County has no need for charters. I find the recent news a for-profit/charter school group has already spent more than $100,000 to help a state house candidate in my race highly disturbing: it’s a clear indication charter zealots of the type we’ve seen in Nashville are planning their next move to hijack our schools. First, I find criticizing our public schools as “government schools” to be unnecessary and unhelpful. My wife and I, as well as our children, are products of public schools and have enjoyed highly successful careers. Obviously our public schools are government funded and are sometimes burdened by too many regulations and red tape, but in Williamson County we enjoy the best schools in the state with great leadership and outstanding educators. They have done their best to be innovative and to offer our students — including my grandchildren — a great education. Each school system should decide for itself what the role of the private sector should be. As a state legislator, I will support parents to ensure their children receive the quality education they deserve from our public schools.